A few of my "hidden potion" books above and below. ABOVE: This was a special order MSD Dolfie sized book that I made. I am proud of how it turned out. Above: Leonardo da Vinci open books. Two of these are special order with a "flying craft" theme. They will be going to a museum in Argentina. Hope to have some photos of that. 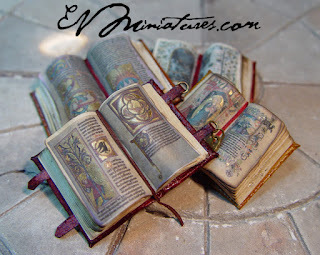 Above and Below: some of my gold detailed or "Illuminated" medieval books. ces livres sont magnifiques, ceux avec les petites fioles me plaisent beaucoup. Tous ont une jolie patine, de belles couvertures. Des livres du temps passé ! Wow, I do not have enough adjectives. This is absolutely wonderful! Que libros mas fantásticos, los de las pociones me han encantado!! Great work as always, Ericka!! Your MSD Dolfie sized book is fantstic! Your little books simply amaze me!!! Wow amazing little books!! How can I buy one??? 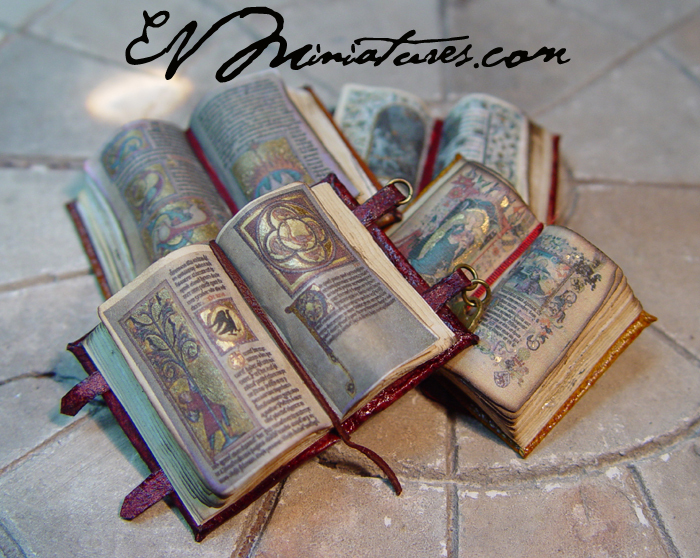 Or you can contact me at evminiatures@msn.com for a special order. These are amazing! Where can I buy one of your hidden potion books? oh my .... just the cutest little eye candy!